Automated patient engagement is becoming one of the most significant drivers in the transformation of health. 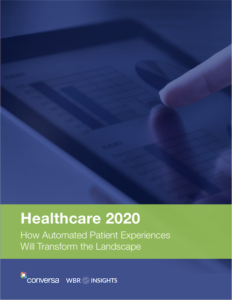 According to Gartner, automated healthcare could account for up to 85% of all healthcare customer experiences by 2020. There is a major shift underway from manual to automated patient engagement leveraging “conversational AI” that is enabling care management programs to be dynamic, evidence-based, and personalized, thus creating new value opportunities in healthcare.The World Business Research (WBR) Group recently published an industry report to explore this topic more. Please complete the fields below to download your complimentary copy of this report. NOTE: You may not see a confirmation of submission though you will still receive an email with the report download in 5-10 minutes. Please email connect@conversahealth.com if you are having trouble. UPDATE 3/6/18: Accenture just released a study showing significant growth in consumer acceptance of automated patient engagement technology.